From the start menu, select the programs submenu, then find and select Microsoft FrontPage. By doing this, Front Page will automatically bring up a new blank page on which to work. 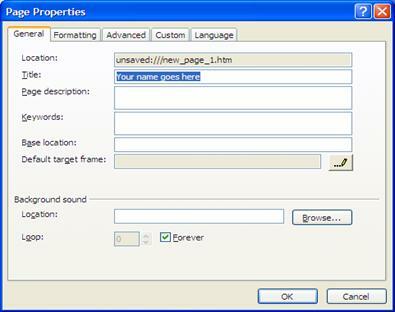 Right click anywhere in the body of the page and select Page Properties from the pop-up menu. Now, be sure that the General tab is active. Click on the text box to the right of Title and name the page <yourname’s> Web Page. Do not click OK at this point. There is still more to do here! 3. Choosing Background and Text colors. 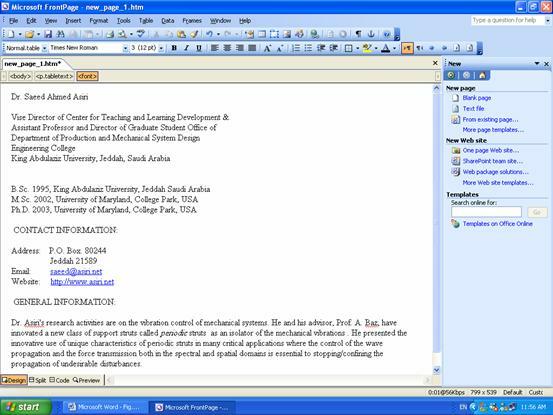 From the same window in Figure 3, click on the Formatting tab. Select a color from the drop-down menu next to “Colors|Background”. Click OK and the color chosen will become the background color. Repeat to select a text color [Colors|Text] by using the drop down menu next to “Text”. (Hint: Be sure that the background color and the text color are not the same). See Figure 4. Adding text to the web page in Front Page is just like adding text in Word. All that is necessary is to click once on the page to activate the cursor and typing in all the information. Click on the page and enter whatever text you would like. 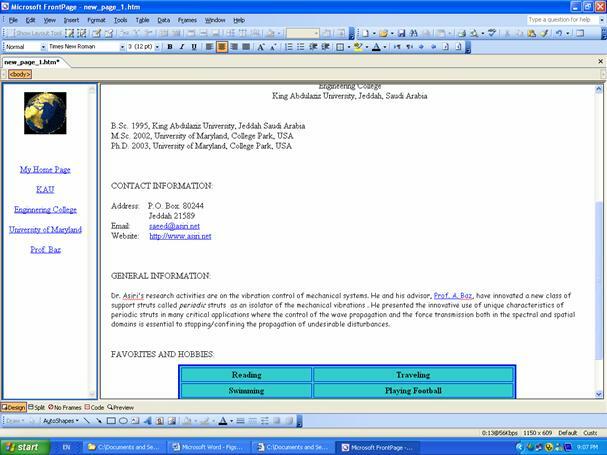 Be sure to include your Name, address , major, your own college, and the words “King Abdulaziz University. Moreover, add your degrees' dates and contact information. Next, add a little bit of general information about yourself. Highlight your Name, Address and Major. Then click the centering button in the toolbar. Highlight your name. 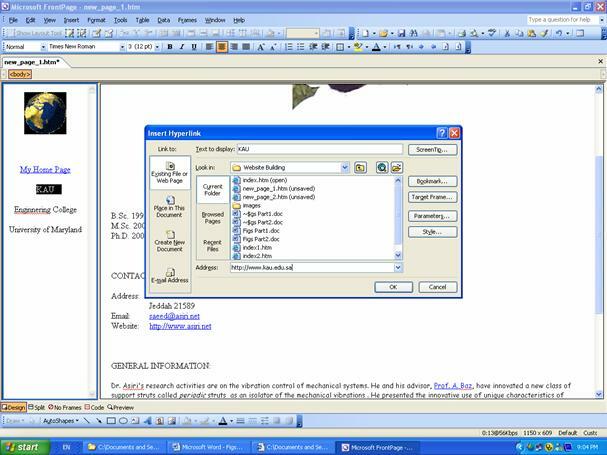 From the style drop-down menu, select “Heading 1” (Figure 7). To the body of your Web Page, enter a short list of some of your favorite things to do. 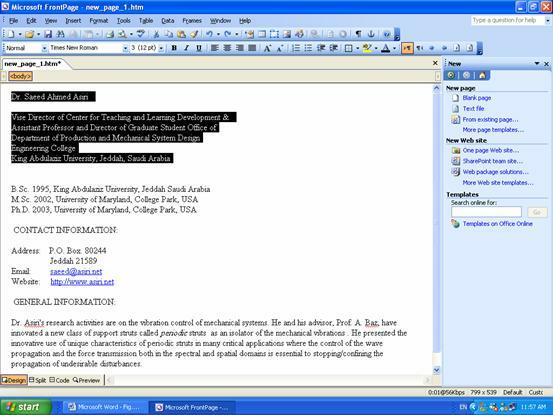 After you have done that, highlight the list of items and click on the bullet button in the toolbar as shown in Figure 8. 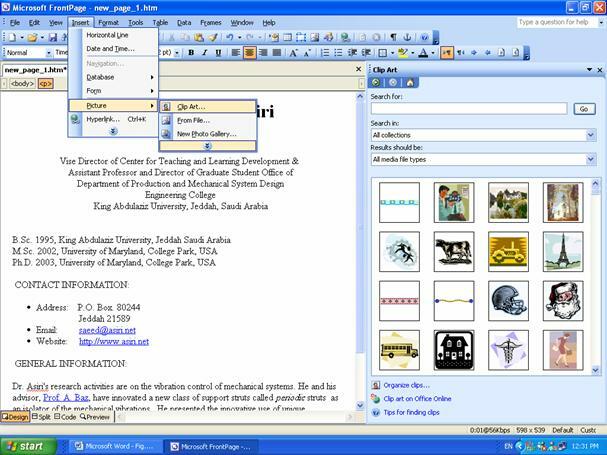 By doing this, the Insert Hyperlink window will appear on the screen. In the URL text box, type in the web address in which you wish to link to. (In our case, we would like to link to http://www.eng.umd.edu/~baz). See Figure 10. Click OK. The hyperlink is now created. 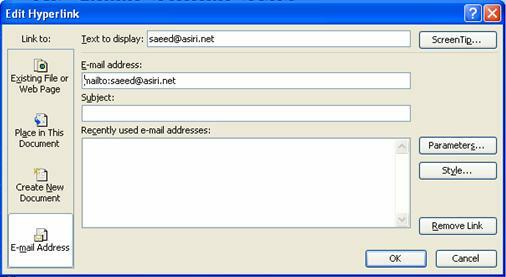 Typing in an email address automatically makes it a Hyper link. But if you would like, you can choose another word or phrase to add an Mail To Hyperlink to. Highlight your chosen word or phrase then right-click to select Hyperlink. On the left hand side under Link To: chose the E-mail address. (Figure 11). Type in the text you want to display and the email address, and click OK.
Now, if users visit your web page and click on your email address, they will be able to send your email without typing your email address. 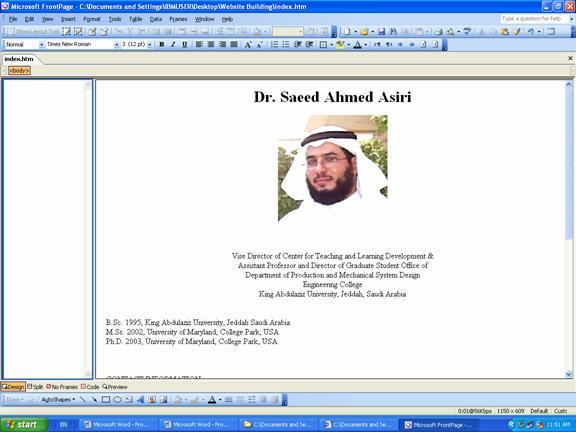 Use your own picture by selecting [Insert | Picture |From File] (Figure 12-a). Right-click on the picture, and then select Copy (Figure 12-b). Click under Major, then right-click, and then select Paste (Figure 12-c). This is one of the features that FrontPage has, adding buttons to make links. Below your bulleted list of favorite things to do, we are going to add three buttons that link to different search engines. 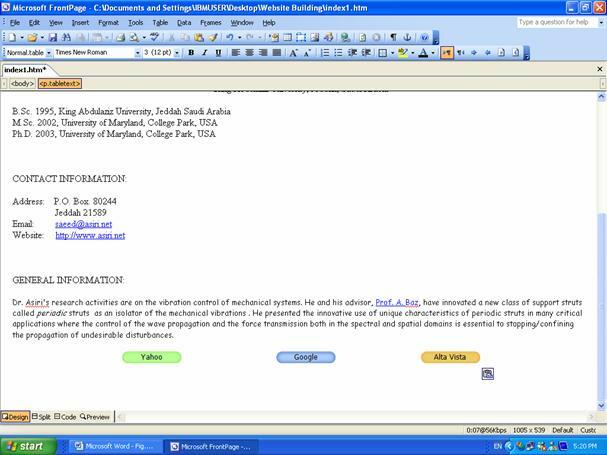 Do this by selecting Insert, then Interactive Button from the menu bar (Figure 15). Repeat this step two more times to make buttons for Google (http://www.google.com) and AltaVista (http://www.altavista.com) See Figure 17. You may want to align these buttons. 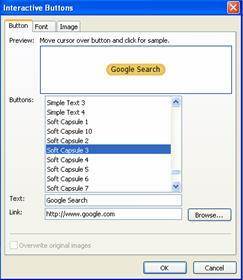 This can be done by highlighting the buttons and clicking any of the alignment buttons from the toolbar. This works the same way as when you align text or pictures. 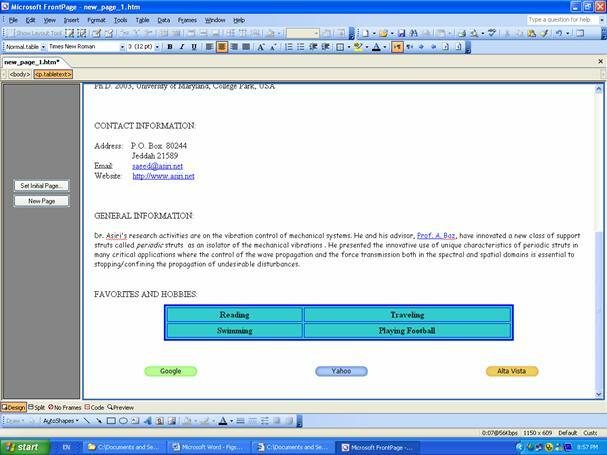 In Front Page, adding a table to the web page is as simple as in Word. In this step, you will insert/add a table with 3 rows and 2 columns (3X2 table). Place the cursor under the favorites and hobbies sentence. Insert the table by selecting [Insert | Table] from the [Table] menu. Select 3 rows and 2 columns. See Figure 18. The table will be added as shown in Figure 19. You will experiment setting the table background color, border size, cell padding and spacing, and using a background picture. 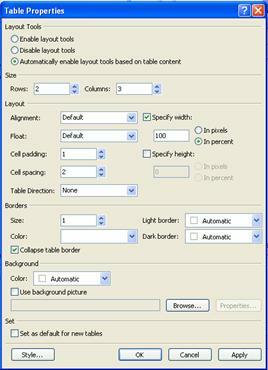 Right-click anywhere in the table and select Table Properties from the pop-up menu. 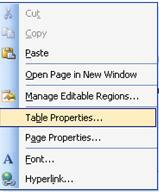 Or click on the table and select Table Properties, Table from the Table menu. The table properties will appear as in Figure 20. 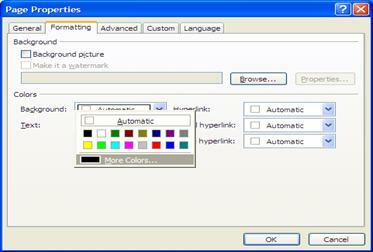 Use background picture, by checking this option, instead of a background color (optional). Cell padding and cell spacing values, etc. The cell properties option in the pop-up menu allows various similar options in the table properties, and others. 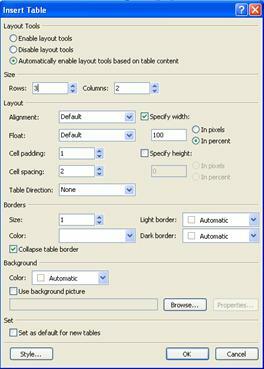 Or you can choose [Table Properties | Cell from the Table menu]. 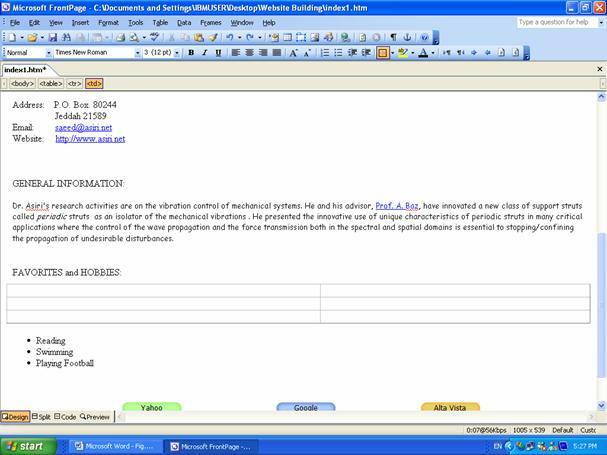 Experiment with the various available options in the cell properties. Move the list of your favorites and place it in the first column of the table by clicking and typing each item in one cell. Delete the previous list by highlighting it and using the backspace or delete keys, or the cut option. Add more hobbies to fill the second column (Figure 21). This is the easiest step. Now that you have created your page, you probably want to see what it would look like if it was already posted on the web. To preview your page, simply click on the preview tab in the lower left corner (Figure 22). Hint: Don’t worry if your buttons show up gray instead of what you wanted them to look like. Some of the special features in front page cannot be viewed until it is actually saved (and then posted on the web). You may also select [File | Preview in Browser] to see how exactly the page will appear when loaded in the browser. To save your page, select [File|Save As] (Figure 23). Save your page to the location of your choice. Name the file as <your-namePage>. Keep this file. You will need to use it in the next part for creating frames. Leave the file type as Web Pages and click OK. Very Important: Saving the file brings up a window called “Saving Embedded Files”. To view this page in the Internet, transfer it along with the embedded files (all images and files) to a web server. This step is critical to insure that all the components of your web page are saved as well. Do not change anything in this window and click OK. See Figure 24. YOUR PAGE HAS BEEN SAVED! Locate FrontPage and start it. 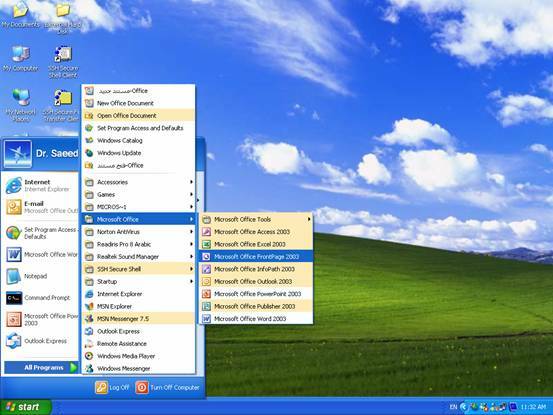 Once opened, select New from the File menu. 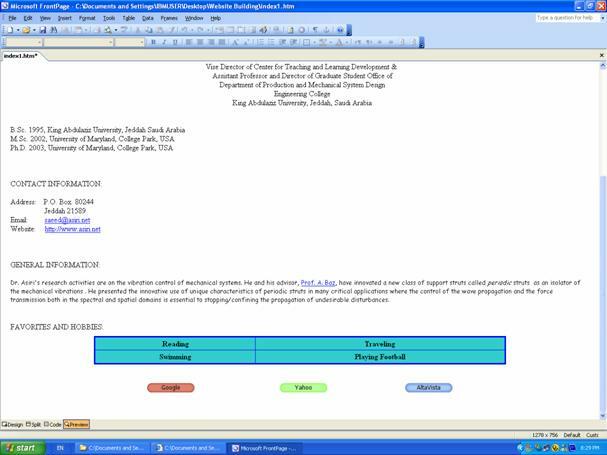 From the Task Pane click on More Page Templates. 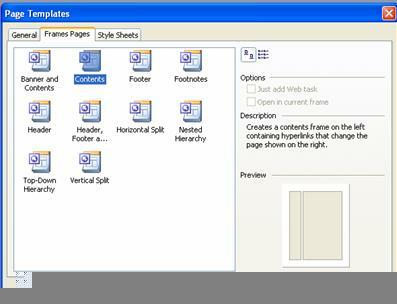 Click the Frames Pages tab in the New dialog box. See Figure 1. Select the Contents layout (its style is shown in the Preview area, which is a 2-column layout). Explore the other Frames layouts to become familiar with them. We will use the left frame for hyperlinks, and the right frame for the display area. Clicking on any link in the left frame will make its contents appear in the right frame. 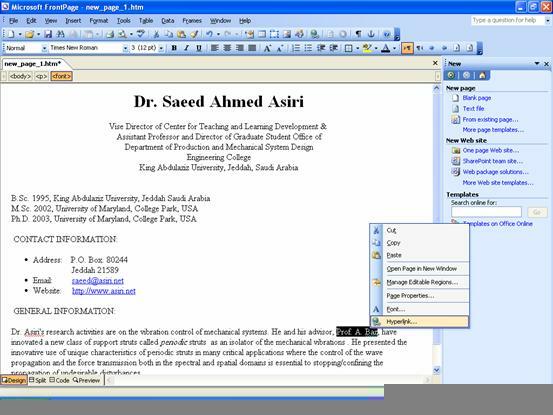 In the right frame, you will insert your web page that you created in the first Front Page lab, or your welcome.html file. 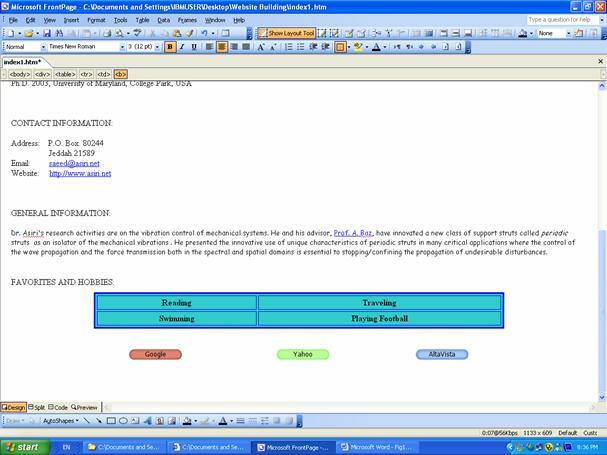 In the left frame, you will create a new web page that includes hyperlinks. 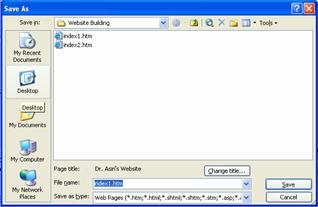 Setting an initial page refers to inserting an existing web page. a) Click the [Set Initial Page] button in the right frame. 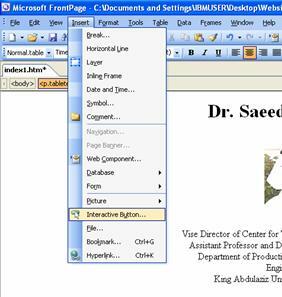 b) The select File dialog box will appear as in Figure 3.
c) Insert your web page from the previous Front Page lab, your welcome.htm web page, or any text page you choose (not a frame layout), by looking for it in the Look in box. d) Once the file is located, select it and Click OK. 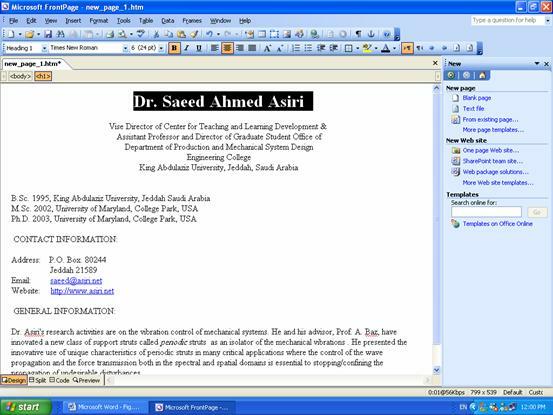 The file will automatically appear in the right frame (Figure 4). (Hint: If you can’t find a web page, you may choose the New Page button, instead of the Set Initial Page button, and proceed in creating the page from scratch. The next step will show how to use this option). a) Click on the New Page button in the left frame. 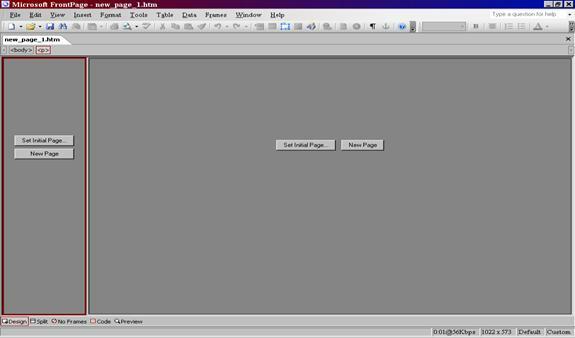 b) A new blank page in the left frame will appear as in Figure 5. (Hint: You may change the width of the left frame by moving the arrow over the border column between the left and right frames, and then dragging to the desired width). c) Load an image of your choice at the top of the left frame. The image can be inserted from a file or from the ClipArt. Feel free to add any links in addition or instead of these links. Each time you enter the name of the link, highlight it, right-click, and then enter the http URL and click OK. See Figure 6. Now that you have the image and the hyperlinks completed in the left frame, and your page already in the right frame, it is time to see what it would look like if it was already posted on the web. To preview your page, click on the preview tab in the lower left corner (Figure 7). To save your page, select [File|Save or Save As]. You will be prompted to save each frame with its own name. See Figure 8. The right frame is already named start.htm, so there is no need to name, unless you have created one from scratch. Save your frames page to the location of your choice. After saving the frames, Front Page will allow you to view the frames within a web browser. a) Click on the hyperlinks that you just created, and verify that they are working correctly. b) Click on the University of Pittsburgh link. It should appear on the right frame (Figure 9). (refer to activity sheet item #1). d) In the browser, select [View | Source] to view the source code of the frames (Figure 10). You are done. To use this frame layout web page in the Internet, transfer all HTML files and images to a server that is connected to the Internet (i.e. 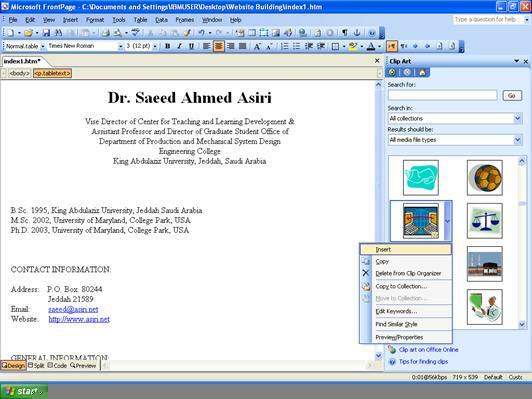 to your html directory on the KAUNET at the King Abdulaziz University, or any authorized Web server).